It’s been multiple seasons of change in the Dallas Cowboys’ back-seven over the last three years as the entire secondary has been turned over since 2015. Only one Cowboys defensive back, safety Jeff Heath, has more than three years of experience and he may not even have a spot in the two-deep by the time the season rolls around. Four out of five projected starters have two or fewer years of experience while 2015 first-rounder, Byron Jones, is the “veteran” of the group with three years under his belt. Add to it the linebacker level where Boise State’s Leighton Vander Esch was Dallas’ first-round pick as he joins veteran Sean Lee and Jaylon Smith as projected starters. The turnover in the secondary is notable for multiple reasons, in part because we’ve also seen the Cowboys make a significant philosophy switch since 2015 and the new additions represent a perfect combination of versatile players capable of lining up in multiple roles all over the field. Today’s NFL is all about the offense dictating matchups to the defense, and the best defenses must have answers to the hybrid offensive players thrown their way in the passing game. The Cowboys have loaded their back-seven with versatile players capable of handling multiple looks from opposing offenses. While defensive coordinator Rod Marinelli often gets labeled as a “cover-2” coach, implying that he employs mostly zone coverages, the 2015 Cowboys played more man coverage than all but three teams in the league at 42.4 percent. The 2016 season was a slight step back in that regard as they ranked eighth at 37.3 percent, but they were still a man-heavy team. However, with three rookies seeing significant time last year, the Cowboys relied much more heavily on zone coverages, lining up in man coverage just 25.2 percent of the time, just 24th in the NFL. Heading into 2017, which way will the Cowboys turn? Marinelli has shown that he’s capable of adjusting his scheme to his personnel, but Dallas has had an influx of youth in the back-seven that is capable of playing man or zone while showing the skillsets to handle any style of receiver or tight end. Let’s take a look at the possibilities. As the PFF Analytics team continues to dive into our 11 years of NFL data, we gain important insights on a weekly basis. One important note is the importance of the slot cornerback in today’s NFL as passes to the slot have proven slightly more valuable than passes to outside receivers. Passes to tight ends are even more valuable than passes to the slot, so finding productive players capable of performing in between the numbers is crucial. Last season, the Cowboys allowed a passer rating of 103.7 to wide receivers in the slot, good for 21st in the NFL. Luckily, every defensive back the Cowboys have added over the last two years has some form of experience when covering the slot, and when Jones is added to the mix as a tight-end-covering specialist, Dallas is as equipped to control the middle of the field as any team in the league. 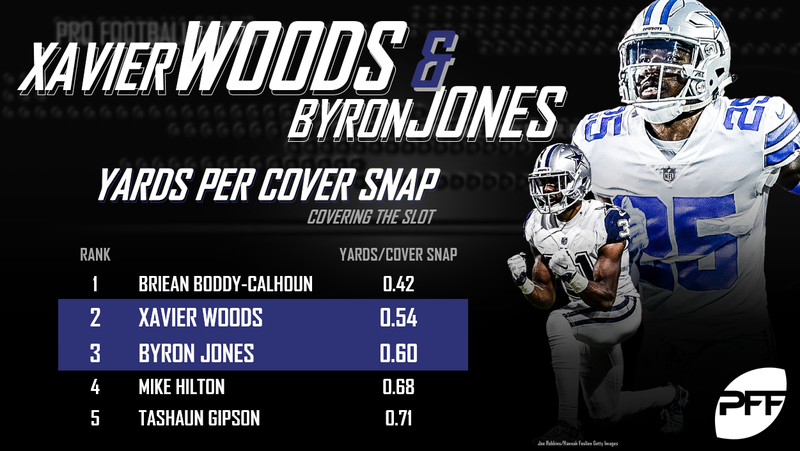 Last season, then-rookie safety Xavier Woods ranked second in the league with 0.54 yards per cover snap when covering the slot while Jones ranked third at 0.60. Jones also led the way with an NFL passer rating against of 51.5 when targeted in the slot, the lowest mark in the NFL. When it comes to matchups, Jones generally draws the opposing tight end, an extremely difficult assignment, but one he handled well last year as he tied for eighth allowing a completion percentage of 50.0 when facing tight ends. He’s reportedly moving back to cornerback as his official depth chart position, but he should maintain his role as a “tight end eraser,” especially in nickel and dime situations. Jones is one of the rare defensive backs capable of matching up with tight ends with length and physicality while also possessing the speed and lateral agility to hang with even the best mismatch weapons. As for Woods, he’s a safety by name, but he had plenty of experience covering the slot in college and it showed during his rookie season. Safeties are often put into a bind due to the various shifts and motions an offense can use in order to dictate matchups, and having a slot cornerback playing safety is a great way to combat anything thrown the defense’s way. Woods is a perfect player in that regard as he can play a traditional deep safety role while also spinning down and holding his own against good slot receivers. Last year’s official starting slot cornerback, Orlando Scandrick, had his worst season since 2011, but he’s since moved on. Woods or Jones can step in for some of those reps, but the rest of the Dallas cornerbacks are also equipped to make up for the loss of Scandrick. Jourdan Lewis is another 2017 rookie who got off to a great start, and he spent most of his time on the outside, but he played over the slot at times at Michigan and his size and movement skills should play well on the inside. Fellow 2017 rookie, Chidobe Awuzie, is a bigger body, but he also showed off his slot skills in college. He was one of the better zone-coverage corners in last year’s deep draft class, but he’s capable of lining up in any key spot and having success. He posted an impressive 81.7 coverage grade last season. Finally, Anthony Brown is heading into his third year, though he took a step back after a solid start to his career in 2016. He graded at 74.7 as a rookie before dropping to only 57.6 last season. He’ll need to get back on track in order for this secondary to live up to its potential. The Cowboys already have one of the league’s best coverage linebackers in Lee who has graded between 80.6 and 90.2 in coverage in every year since 2011, while ranking second among linebackers in 2015 and seventh in 2016. He can handle running backs in man coverage while showing the range and closing ability to make plays in zone. Last season, Lee was flanked by Anthony Hitchens and Smith, both of whom had their limitations. Hitchens was better against the run and he’s moved on to the Kansas City Chiefs while Smith is only a shell of his college self, as his disastrous knee injury in his last college game has sapped him of his next-level athleticism. Enter 2018 first-round pick in Vander Esch, who looks like a perfect complement to Lee in a versatile defensive scheme. 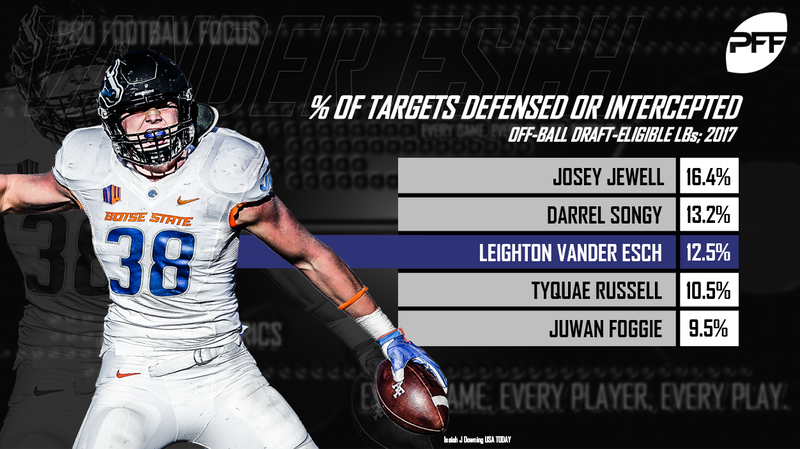 Vander Esch’s breakout 2017 saw him post an 86.2 coverage grade that ranked 11th in the draft class as he flew to the football on underneath routes. He still has work to do on passes thrown at the intermediate level in zone coverage, but his movement skills (4.65 40 time, 6.88 3-cone) will make him yet another asset as he covers running backs out of the backfield and learns the nuances of zone coverage. Lewis does his best work on the outside, but he has the movement skills to cover the slot. He was the nation’s No. 3-graded cornerback in 2015 at 89.9 and he got off to a fine start as a rookie with a 79.6 overall grade last season, good for 49th in the league. Awuzie had a strong college career, grading at 85.6 overall in 2015 and 84.3 overall in 2016. He had the No. 38 grade in the league last season at 81.7. After exceeding all expectations as a rookie in 2016, Brown regressed in 2017 as his overall PFF grade dropped almost 20.0 points. He may see a decrease in playing time of Jones does move to cornerback on a full-time basis. While Jones played more of a safety role on early downs the last two years, he may be moving back to cornerback this fall. Regardless of positional name, Jones is one of the best in the league at covering tight ends, but he also has the length and quickness to match up with bigger receivers and sharp route-runners. That versatility makes him one of the biggest keys to the Dallas secondary and he’s coming off a solid 83.5 coverage grade last season. Woods plays the hybrid safety/slot role to perfection, giving Dallas an answer to the constant shifts and motions presented by creative offenses. Annually one of the best coverage linebackers, Lee brings range in zone and the ability to man up against opposing running backs. Smith was once an athletic linebacker who could fly to the ball, but he’s clearly not the same player due to his injury history. However, there’s still hope that he can regain his form and he still showed well in coverage last season, grading at 80.1. Vander Esch is built in the Marinelli mold of athletic linebackers who can add great range at the intermediate level. He could develop into one of the league’s best coverage players, and like Lee, his movement skills allow him to succeed both in man or zone coverage. It’s never been more difficult to play coverage in the National Football League. In some respects, coverage units are only as strong as their weakest link, especially when going up against the league’s more creative and versatile passing offenses. The best coverage units have answers, whether it’s finding players capable of matching up with the variety of receivers found around the league or simply being able to morph back and forth between multiple coverages. The Cowboys have almost completely re-tooled their back-seven over the last three years, and they’ve added talented players with answers for everything an offense will throw at them. Even just in the division, whether it’s the Eagles’ multiple tight-end look, the Giants’ creative usage of Saquon Barkley, or the Washington Redskins’ short-passing attack with new quarterback Alex Smith, Dallas has the bodies to handle the various wrinkles thrown at them every week.